Just to be clear: I am a warm weather golfer. First choice: playing golf when temps are in the 70’s. Second choice: 80’s or 60’s. If arm-twisted: 50’s. Anything warmer and I am in the pool. Anything colder and I light a fire. Having said that, I live in the northeast and I have friends who are far hardier than I who insist that I occassionally venture out and play cold weather golf. Let me explain that I only do this under duress, and only for really, really good friends. First, how I dress. Basically, I pretend I am going skiing, and dress accordingly. Wool hat. Layers of micro-fiber clothing. Turtleneck. Wool sweater. Two pairs of socks. Second, how I warm up. I am a big stretcher, as a matter of course and I do extra stretching, BEFORE I layer on the clothing. Then, before I take a swing, I do five minutes of light aerobics. By “light”, I mean jogging in place to get the blood flowing, particularly to make sure my back is loose. I always like to hit golf balls before I play, and that is imperative when it is cold. There is a very real risk of injury if you take a full-swing with a driver in cold weather without warming up. In cold weather, I warm up by chipping (even if I am on a driving range) and slowly build to a full swing. I am particularly keen to the feedback my body gives me in cold weather. If I have stretched properly and gotten the blood flowing while inside and warm, making the transition to chipping and ultimately to a full swing should be smooth and not creeky. Third, how I play. My personal priority is to be warm and I over-dress accordingly. Hence, I make a mental adjustment to the “game” I play in the cold. Rarely do I take a full golf swing in cold weather — partly because I am so bundled up I cannot always make a full swing! So I go into the round with a strategy of playing a lot of knockdown shots — partial backswing, aggressive through the ball, and rarely a full release. Chances are I am wearing so much clothing I cannot take a full swing anyway, so I decide ahead of time to use a cold weather round of golf as an opportunity to work on a specific shot — a knockdown shot — it’s an opportunity to practice a shot I employ a ton in “real life,” and the shot fits the playing conditions for that day — the practice pays off big time in the spring!! Do you play golf in cold weather? Leave a comment on LeslieAndrewsGolf.com. 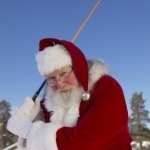 This entry was posted	on Tuesday, December 20th, 2011 at 4:05 pm	and filed under Blog and tagged with cold weather, playing golf in cold weather, warm up for golf, winter golf. You can follow any responses to this entry through the RSS 2.0 feed.